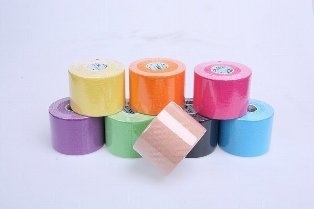 Kinesio taping is a technique used to aid the body’s rehabilitative process through the connection of multiple receptors of our body system. Designed to duplicate the characteristics of our skin, kinesio tape supports better posture while lessening muscle strain of the affected area as it prevents damaging range of motion. Emulating the skin, it permits enhanced lymphatic flow and microcirculation while reducing inflammation and pain. With the support of kinesio tape, the restoration of normal muscle function is enabled within and beyond the chiropractic office. The patient becomes active in the therapeutic process by maintaining treatment goals between chiropractic office visits. Kinesio tape is safe for all ages, from pediatric to geriatric, and successfully treats a variety of orthopedic, neuromuscular, neurological and other medical conditions.